The epic winter storm season has been a big plus for travel agents. As more folks are trying to escape the crazy low temperatures, travelers can expect to be paying more this week for vacations. Business travelers are benefitting from supply and demand, as a trio of forces are leading to a sixth straight week of dropping prices (more on that later). What else is going on? 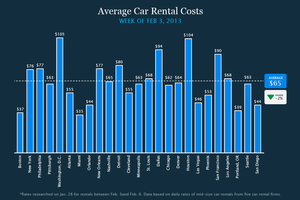 Well, car rentals are down a bit, though the big cities continue to hit triple-digit daily prices. 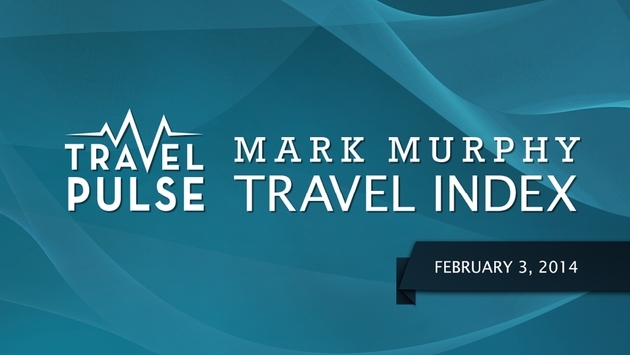 To be clear: Our numbers are based on research done last week looking for fares and rates for the Feb. 3-6 window, except for leisure airfare, which was researched for the week of Feb. 8-18. 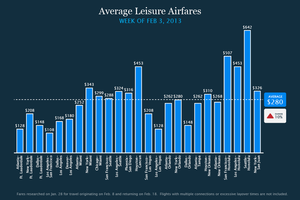 - Mid-winter vacation plans are putting pressure on leisure fares, as ticket prices jump another 10 percent this week. - There are still good fares to be had compared to peak holiday prices, but ticket prices are beginning to climb on flights to destinations that promise an escape from polar vortex temperatures. - Fares are up across the board on flights to Florida, and on West Coast travel between Seattle and San Francisco and Los Angeles. - Ticket prices are holding steady for travel between Honolulu and Los Angeles, but Hawaiian getaways will be more expensive for vacationers leaving from San Francisco (up 16 percent) and Seattle (up 29 percent). - The only routes this week that reflect a drop in prices are between Las Vegas and Los Angeles (down 7 percent) or San Francisco (down 5 percent) and on flights between Atlanta and Orlando (down 12 percent). - United has opened its new Global Services reception area in Terminal C at Newark International Airport. Located via the “Premier” entry at Door 4, the lounge has dedicated check-in and security lines for the airline’s top frequent fliers and for First Class passengers on United’s international flights. - Fans of Alaska Airlines should keep an eye on the airline’s fleet this year — CEO Bradley Tilden has announced a new design for the livery, featuring a “more energetic and compelling” Eskimo. - Ticket prices are down an additional 9 percent this week as bad weather, flight cancellations and typical mid-winter drops in passenger loads combine to create the perfect storm of low fares and available seats. - Fares are down sharply on transcontinental flights in particular, with roundtrip ticket prices under $300 on flights between New York and Los Angeles, and significant price drops on flights between New York and San Francisco (down 19 percent from last week). - Flights to Europe are more expensive this week, but travel to the Pacific is less expensive, thanks to price drops on flights between San Francisco and Hong Kong (down 23 percent), Los Angeles and Sydney (down 28 percent). - Ticket prices are up again this week on flights between Boston and Chicago (up 15 percent) and Detroit to Atlanta (up 57 percent). - Delta is asking for feedback on its new Sky Club services. The airline is testing new food and beverage items at 10 Sky Clubs across the country between mid-February and mi-April. The clubs will also features shoe shines, manicures and chair massages. Test locations are in Atlanta (A 17 and Concourse F), Detroit, New York (LaGuardia, Terminal D), Los Angeles and Seattle. - It's a story of opposite trends once again. 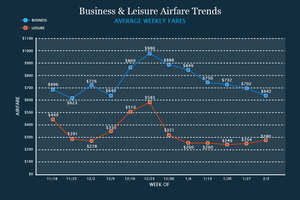 Leisure fares continue heading up, while business fares continue falling. - For leisure, prices are up $26 on average this week, but are still more than half off the prices around Christmas. 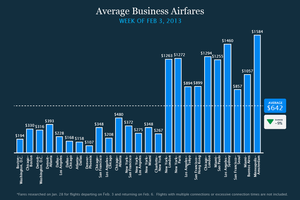 - Business fares are down once again, dropping $60 on average this week. It's the sixth straight week of price drops, and $338 lower on average than the high in our surveying the week of Dec. 23, 2013. 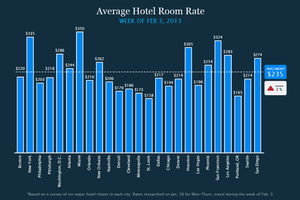 - Business and leisure fares may be heading in opposite directions, but hotel prices continue to climb. Rates are up another 3 percent this week, and rooms are full in several cities; travelers can expect to find the best deals at airport and suburban properties. - Houston is teeming with visitors this week, as the cities hosts a huge oil and gas prospectors convention, along with a space exploration conference for teachers and an annual get together for drilling contractors. Phoenix is home to the FlexTech Conference for “flexible and printed electronics” professionals, TechCon North America (high voltage power equipment ) and a conference on Energy, Utility and the Environment. - San Diego will be home to National Title 1 educators, Training 2014 for professional trainers and learning professionals and a conference for EdTech teachers. Seattle hosts the Society for Research on Nicotine and Tobacco, as well as conferences for UX and AX professionals. - Lowest Hotels now offers free Wi-Fi to guests in all rooms of the hotel’s 19 properties. - Guests at participating Hilton Hotels will earn 1,000 bonus points for weeknight stays, and 5,000 bonus points for two night weekend stays at participating properties between Feb. 1 and Apr. 30. Just be sure to check with Hilton before making reservations — a substantial number of properties are NOT participating in the program. - Car rental rates are down 2 percent this week, but prices remain high overall. - Visitors can expect to pay over $100 per day for a rental in both Washington, D.C. and Houston, and daily rates are also pricey in Dallas, ($94), San Francisco ($90) and Detroit ($80). - The good news is that prices are slightly more reasonable in Boston (down 25 percent), Portland (down 19 percent) and Seattle (down 19 percent). - Hotels inch up again for the second straight week and are now at their highest mark since we began tracking during the week of Nov. 18, 2013. 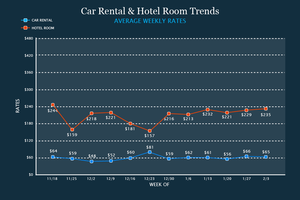 - Car rentals are down slightly this week ($1) after reaching a non-holiday high in our tracking last week.